While the generation gap is not a new phenomenon, it is a topic that has seemed to take up a lot of space in media coverage, boardroom conversations and around the dinner table in the past few years. There was always a question mark hanging over what exactly was going to happen when all those baby boomers got old anyways? And now we are all feeling the disconnect – in an age which connection is at a premium. One of the things that I love most about Guiding is that we create a space for intergenerational dialogue. Note that I did not say interaction – the generations all interact on a daily basis – but in Guiding, through working together in Unit meetings, event planning, committee work and socially, we have a space for conversation that is not regulated by the rules or structure of family or work or school. 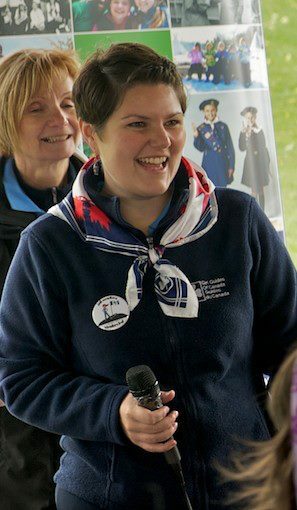 What are the generations in Guiding? I could spend a lifetime explaining the characteristics of each generation and sub-group, but for simplicity’s sake, let’s use Guiding terms! The Silent Generation – The children of the Great Depression, these are our most senior Trefoil Guild members. They are very rarely on email, but will definitely write back when sent a hand-written note by post! Baby boomers – This is probably a Guider or member of the Trefoil Guild who has likely been a Member for 25+ years. Most of these ladies are comfortable with email, but some prefer other methods of communication. Some are on Facebook, many are not. Generation X – This is also probably a Guider, but it could also be a parent (and just because they’re Gen X doesn’t mean we can assume they are Pathfinder/Ranger Moms – all bets are off with Gen X). These ladies are rapid fire emailers for the most part and they’re probably on Facebook (if only to spy on their kids). Generation Y – This is your young Guider, or maybe a Spark Mom, but there is a good chance she doesn’t have kids yet and is either in university or starting out in her career. These ladies are generally delinquent emailers, but will reply to a Facebook message, text or Tweet within a microsecond. Digital Natives and Gen AO (Always-On) – These are our girls! Try telling them you were born before the Internet was created – that’ll really blow their minds! Intergenerational dialogue can be explosive or magical – depending on how you go about it! The glue that holds all of this together is the notion of mentorship that Guiding offers. In a successful mentorship relationship there is learning on both sides of the coin – the mentor gains as much as the mentee and they share a mutual trust and respect for one another’s views and life experiences. Most Guiders will agree that they learn more from the girls than they ever thought they would! But believe it or not, that’s the easy part! The larger the generation gap, the easier it is for traditional roles of “respecting your elders” to come into play. How about the young Guider working in the same Unit with a lifer? It can get tricky! By taking some general principles of communication (and common courtesy) into consideration, the exchange of perspectives and experiences can lead to an enriching experience for all generations (girls, young Guiders and lifelong Guiders alike!). DON’T be dismissive. Respect – This is a loaded word that often means different things to different generations. Some see it as something that should be given due to age or positions of power, whereas others see it something that is earned (and can therefore be taken away). The key to intergenerational respect is to take each other seriously and not be dismissive. In fact, there is hardly anything more disrespectful than dismissing someone’s input or opinion. Seek to understand what they are trying to communicate and why, and acknowledge their contribution, whether you agree or not. DON’T criticize in front of others. Sounds like a duh, right? Believe it or not, lots of people cannot help themselves from making a comment right on the spot when they feel strongly about something! This is the fastest way to put a Baby Boomer or Gen Xer on the defensive, and the most effective way to get a Gen Yer to consider quitting. Be kind – if you are in disagreement or have a constructive criticism to make, pull the person aside and address the issue privately and respectfully. They will be a hundred times more likely to positively receive your feedback if they appreciate the way it is delivered. DO listen…and Share. Do a good job of listening when it’s your turn to receive information, and don’t be shy to share when you have something to offer. Seek balanced contributions – don’t be intimidated to speak and solicit contributions from those that are keeping quiet (and if you’re the big talker, try to be concise and aware that you have the potential to derail a potentially great collaboration!). DO be generous with praise. Everyone likes to know when they’ve done a good job! Especially with Gen Y, being a part of a great team is really important for them and an essential part of team building is recognizing little successes as well as big ones. Do a post-mortem after an event to learn from your experiences and celebrate what went well – and celebrate the team as well as the achievement. The Sisterhood of Guiding starts with each and every one of us! DO embrace our differences! When you approach intergenerational dialogue as cultural differences, just think about how much fun you’ll have learning about another’s way of life! Enjoy celebrating in the magic that is the Sisterhood of Guiding across the country and the generations! NOTE: Another curiosity about Guiding is that we not only have the generation gap to negotiate, but it is often accompanied by an experience gap – sometimes the girls have been Guiding longer than the Guider! To learn more about the experience gap, check out the Trial By Fire Series: Reflections of First Time Guider. By guest blogger Emily Koehler-Lemaire. Emily is a staffer for GGC – Québec Council and amateur Blogger. She’s under 30 (barely)! We’ll select the best reviews and notify the new reviewers by mid-summer. All book reviews will be posted on GirlGuidesCANblog, and who knows! We might even have a live author discussion too! Note: The reviewers will be encouraged (but not required) to sign on to GoodReads, the largest online site for readers and book recommendations in the world, to connect with us and with any of our Members interested in what others are reading! Help us grow our book club! Email submissions to marketing1(@)girlguides.ca with book reviewer in the subject line. This entry was posted in Girls' Guides and tagged diversity, female role models. Bookmark the permalink. Thanks, great post! As a Generation X-er who previously spent a lot of time working with Link members (trying to help them become more active in Guiding), you’ve summarized a lot of what I was trying to convey both to young adults in Guiding and to those working with them! (FWIW, I’m currently a Trefoil Guild member and potentially in 2 years a Spark Guider with my daughter, so you’re right about “all bets are off” with what they might be doing. And Twitter and email are my communication methods of choice, with FB just behind).